A male Calliope Hummingbird (Stellula calliope) hovers between feedings on the spring bounty of the Absaroka Range, about 15 air miles from the North East Entrance to Yellowstone National Park. Captured with a Canon 7D with 500/4.0L IS + 1.4 TC III in manual mode at ISO400, f/6.3, and 1/320th of a second. The camera was mounted on a Gitzo 3540XLS and Induro GHB2 gimbal head with custom long lens support. I was planing on slipping over the pass into Yellowstone for the weekend. The pass was closed the day before, so I called to check and see that it would be open and I was told it would be open "first thing in the AM." I was up the pass shortly after sunrise and it was still closed, and there were a number of others who were waiting to get in so they could ski. I spent some time on the snow took photos of the American pipit and White-crowned Sparrows that were foraging in the few places where the earth showed through the snow; but then it was time to head down. I have a friend who lives about 15 air miles from the park's North East Entrance and he is always talking about his hummingbirds, so I made the trip that way (I was just not feeling good about the long drive around to get into the park). On the way to his place I stopped to shoot a few Mule Deer does with their fawns; but was set to get to the hummingbirds. I spent the next nine hours shooting around 1,500 photographs of hummingbirds. I had a great time, and am quite happy with the shots I got. I did not get shots of the birds actually at the flowers, as the background near the flowers did not work; but the perched and in flight shots made me happy. 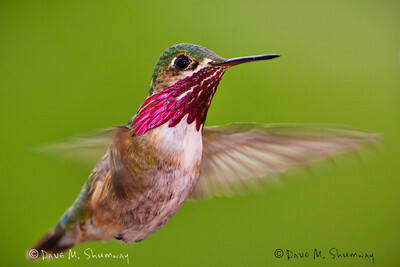 Mr. Shumway, you captured the dazzling colors and playful spirit of the hummingbird shown above. Although the little bird is in flight, you caught the wings in mid-air and his feathers are in focus. Your picture is most delightful. Thank you for sharing it with us.